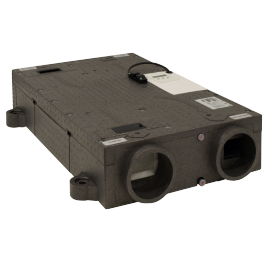 Xpelair Xcell Stratum S120Q, a compact and installer friendly Mechanical Ventilation with Heat Recovery (MVHR) unit that is up to 90% efficient. The product is constructed from lightweight EPP material and, at only 11kg, weighs less than a small dog! Come and see for yourself how Stratum can provide a solution for your next project! Xcell Stratum S105QVI up to 88% efficient 105m3/h low profile horizontal heat recovery extraction with 125mm spigots and integral programmable digital 3 speed controller and timer. Lightweight EPP construction for simpler loft or ceiling installation. 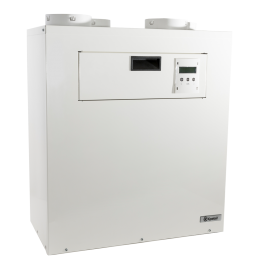 - See more at: https://www.xpelair.co.uk/product/92919AW/S105QVI-Xcell-Stratum-105m%C2%B3-h-Multi-Speed-Performance-Horizontal-Heat-Recovery-Unit#sthash.D7WZvVsp.dpuf Xcell Stratum S120Q up to 90% efficient 185m3/h low profile horizontal heat recovery extraction with 125mm spigots and integral programmable digital 3 speed controller and timer. Lightweight EPP construction for simpler loft or ceiling installation. Xcell QVI units feature EC Ultra low energy use motors and are constructed from powder coated stainless steel and incorporates a heat recovery counter flow cell with up to 92% recovery efficiency. Access to both the cell and the G4 filters for cleaning is by easy turn access panels. Four connection spigots are located on the top of the unit which makes the unit ideal for locating within a loft void and wall mounting brackets are also supplied.